Two Time Tony Award Winning and Academy Award nominated actor, Jim Dale, brings his critically acclaimed one man show to the West End. Following a big Off-Broadway success in Manhattan, Jim Dale arrives at London’s Vaudeville Theatre to share his amazing stories and experiences. Dale is one of the world’s greatest stage entertainers, with a career spanning 6 decades! British born Jim Dale has had a career in music, comedy, film, stage and television being best known for the Carry On films, as the lyricist from the film Georgy Girl, for his work narrating the Harry Potter audio books in the US, his work on Broadway and his role in the ABC series Pushing Daisies. From being the youngest comedian on the British Music Hall stage to his dalliance with Sir Laurence Olivier, to starring in 11 Carry On films, originating the role of Barnum on Broadway and being the “toast of Broadway,” to being given an MBE by the Queen, Jim Dale tells it all in a glorious 2 hour tale. Accompanying Jim will be pianist Mark York. The show is directed by Richard Maltby Jnr, with designs by Anna Louizos and musical arrangements by Aaron Gandy. For the chance to spend an evening with one of the biggest British stars of all time with unrivalled charm and charisma, book now! Just Jim Dale runs from Tuesday 26th May to Saturday 20th June. 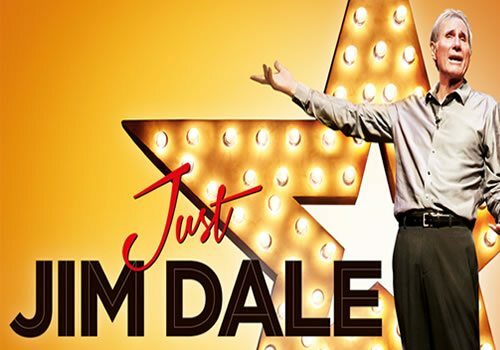 Just Jim Dale is suitable for audience members of all ages, but those who have a good understanding of the star will enjoy the show the most.